The physical is the square and the Zodiac of the Dendera is the physical. The 36 decans are anchored in the corners by the four elements held up by the female energies. 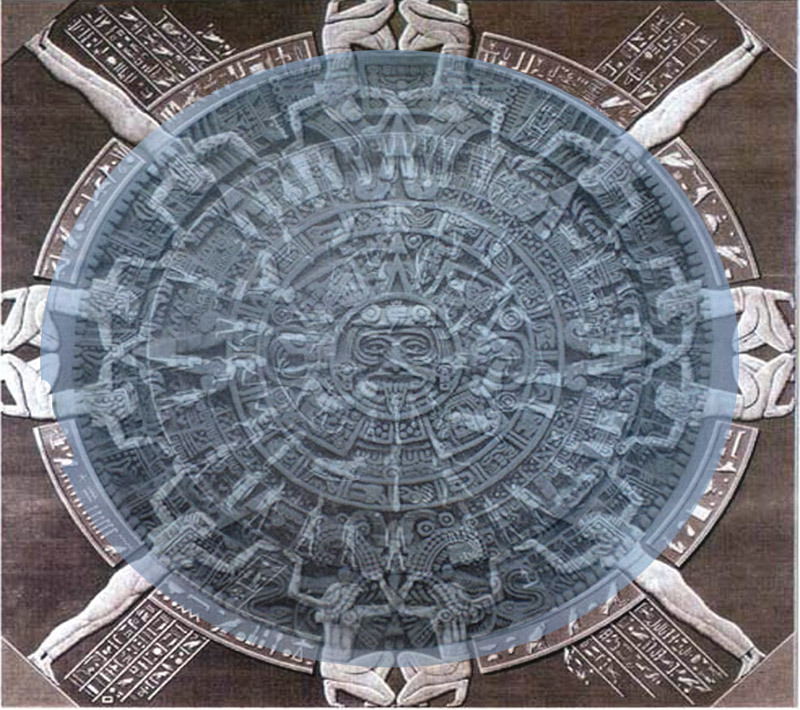 The spiritual is the 20 days and is the circle of the 20 days represented in the Aztec sunstone. It is a male face. These 2 calendars are designed by a common hand. They correlate visually and thematically. They were originally intended to be used together. They were split apart and located on two separate halves of the World. Observe first, the overall composition of the size and thicknesses by studying the history of these two stones. They were both confiscated and hauled away with great effort. In other articles, these stones will be calibrated and revealed as to their deep and profound meanings. This part ; one of the main themes of artstrology, will be represented here visually. They are historically, the most profound and relevant works of art on the planet at this time. Overlay. The Hippopotamus figure of the Dendera fits under the 2 dots of the ForeHead which represent the hippocampus of the brain and pineal gland. The tongue points down and perfectly covers the man holding the woman's hand. The man's feet are just over the falcon which is now sitting on a dot from the sunstone. The dot covers and matches the top of the indicator. The indicator points to the first decan of aries. The two brothers are now blended with the falcon headed warriors and they share to hold the others auras. All are dressed in new apparel. At the top, the glyph for Aj fits precisely between the two falcon headed warriors. The concentric ring inside which contains the 20 days, also nicely corresponds with the inside set of figures from the Dendera. The four arrows fit into the V shape formed between the hands to the elbows, which also has deeper meaning. Even this rudimentary display leaves little doubt that the two are made from the same designer. Especially if one knows the symbols and alignments. Copyright © 5 Batz, week of Kej, Decan of Bear Aug 14, 2012 Artstrology.com, Permission is granted to copy and redistribute the articles or pictures in this article for non-commercial purposes provided that the content remains complete without edit , full credit is given to the Creator and the Ancestors, and a link is provided to Artstrology.com.